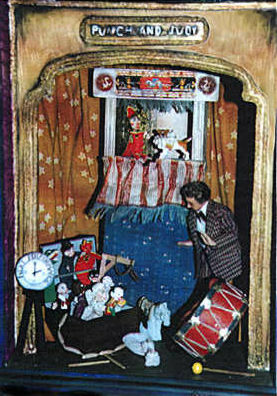 "Jana's Punch and Judy Show"
I started in 1997 with a kit for a 9 x 12 box which contains the whole scene. It has glass on the front and on part of the top. Once I decided I wanted to do a Punch and Judy show I had the great pleasure of researching and then the job of deciding how I could present as much of the spirit of the show as possible in this small space and in 1/12 scale. I didn't want the scene to be identified with a particular time period but I did want a synopsis of the historical Punch. The stage-within-a-stage helps to present the troupe, the clock shows that there will be a show later, but this isn't it. The puppets in conversation with the professor are all visible because it's between shows. I put in some props -- a suitcase to carry the puppets, gallows, drum, sausages -- and would have liked to do more but decided to use a little restraint. The number of puppets was arbitrary, too, but seemed plenty for one punchman. The puppets are made of Paper Clay and painted. The 6 Fimo man who is the professor was made by Darla Knox. I wanted the puppets to be somewhat crude, reflecting my favorites among the old pictures I'd found, and remembering that like human actors these characters are, after all, in stage makeup. Punch is sitting on the board, not down in the trunk. He is a star. The baby is on the ground -- practicing?